It’s no secret that mobile is becoming increasingly important in consumers’ shopping journeys. Retail brands as diverse as Target and Neiman Marcus have alluded to the pivotal role that digital plays in driving both their online and physical store sales. And of course when we say “digital,” often we mean mobile. In fact, for many retailers, mobile is becoming the front door to the store. If a just-released study by Adobe Analytics proves to be correct, an important milestone will be reached this holiday season. For the first time ever, more U.S. shoppers will visit a retailer’s site using a mobile device than a desktop computer. Because conversion rates remain higher on “traditional” devices, the amount of actual purchases made on desktops will still exceed those made on a smartphone or tablet. But that’s not likely to be true very much longer. This shift is profound, and mirrors what other studies have shown about the growing integration of mobile devices across all dimensions of retail. 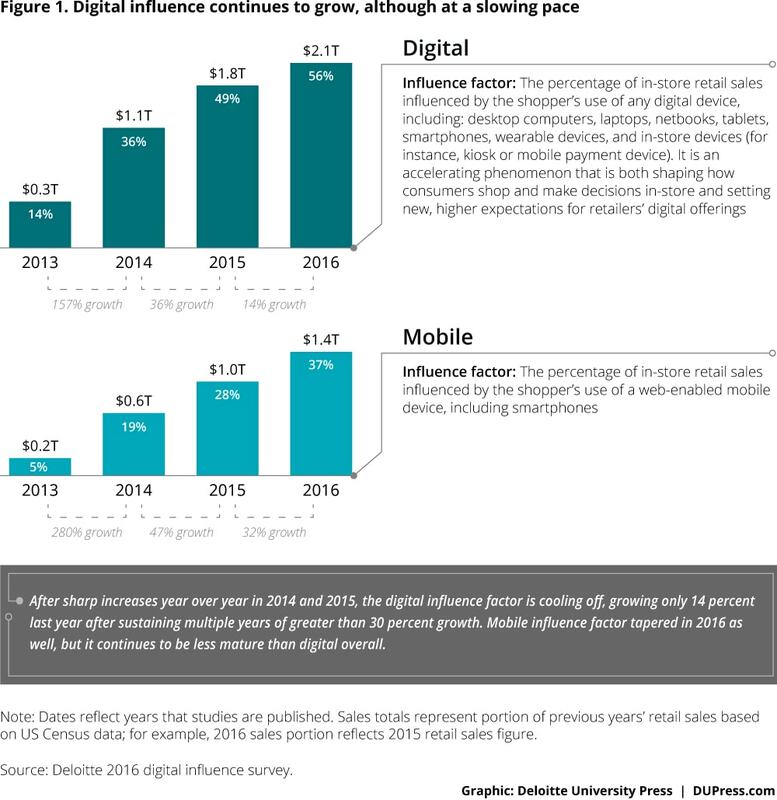 For example, Deloitte has been tracking digital’s influence on physical store shopping, and their research shows that in 2016 some 37% of all brick & mortar sales were influenced by a mobile device. It seems certain that number will easily surpass 40% this year. The reasons this year’s holiday numbers are so important are twofold. First, and most obviously, it’s the busiest shopping time of the year, so shifts in customer behavior are amplified. Second, for consumers seeking great gift ideas, in many cases they’ll be visiting new or infrequently trafficked sites. A poor (or even less than remarkable) experience can have a significant impact on customers’ future buying intent. It would appear that there is no going back in the move to mobile. As the folks at Google like to say (full disclosure: a recent client), we no longer go online; we live online. More and more, our smart devices are a constant companion in the shopping process. Whether it’s for product research, checking prices, locating the nearest store, downloading a coupon or making a transaction, employing mobile technology to enhance the customer experience is moving from novelty to habit. The Trump administration’s issues with spelling are “unpresidented.” Here’s a brief history, which doesn’t even include yesterday’s announcement of “John” Huntsman as the new ambassador to Russia. To be sure, Trump’s problems with spelling and diction are hardly the scariest things about his Presidency. But any important relationship is built on trust. And sometimes it’s the little things that give us away. Imagine boarding a plane and as you pass by the cockpit you notice candy wrappers strewn about the floor and that the captain has his shirt untucked and shoelaces untied. Imagine you are doing some financial planning and your advisor has gotten the time of your appointment wrong the last three times you were scheduled to meet. Imagine you are being prepped for surgery and the anesthesiologist keeps forgetting your name and can’t seem to remember where she left her glasses. It’s all too easy to get distracted by small, unimportant stuff. And our obsession with perfectionism often does more harm than good. But some behaviors are small, yet meaningful clues to issues that demand our concern. As long as we’re dealing with humans, mistakes will be made. We need to let most of that you-know-what go and strive to be compassionate to ourselves and others when the inevitable happens. Yet a consistent pattern of general carelessness or wanton disregard for others can be another matter entirely and we shouldn’t take such an accommodating stance. Ultimately learning to discern the types of mistakes to actually worry about is where we should put out attention. I hope we all can make peach with that. It’s been happening for a few years now, but the pace is accelerating. Retailers waking up to the reality of a slow or no growth world. Retailers beginning to understand that if you don’t garner share of attention, you have little or no shot at share of wallet. Retailers starting to comprehend that it’s not about the silos of e-commerce, catalogs, social, mobile and physical stores. It’s about one brand, many channels. Retailers seeing that it’s not only a digital first world, increasingly it’s a mobile first world. Retailers coming to terms with having too many stores, and being confronted with the cold hard facts that the ones that should remain are often too large and, more importantly, too boring. Retailers recognizing that continuing to offer up average products for average people is a recipe for either long-term mediocrity or inevitable bankruptcy. Retailers realizing that most of their e-commerce growth is now coming from channel shift and that much of their “omni-channel” investments are proving unprofitable. When historically strong brands like Nordstrom and Neiman Marcus start taking a big whack at their corporate staffs and pulling back on capital investments, it’s hard to argue that this is just about low oil prices and weak foreign tourist traffic. The big reset is upon us. Some get it. But too many clearly don’t. Change is happening faster and faster. Disruption is now just part of the ecosystem. If you believe, as I do, that we are in for an extended period of muted consumer spending, that we are way over-stored in most major markets and that the power has shifted irretrievably to the consumer, then business as usual–and relentless, but vague promises to become “omni-channel”–will not cut it. The discipline of the market will be harsh. Good enough no longer is. If you aren’t worried, chances are you should be. And if you aren’t in a hurry, you might want to pick up the pace. Overtly acknowledging that someone started something important or invented a wholly new product, process or movement seems like the decent thing to do. In fact, when another person is the pioneer or ups the ante it can be precisely the impetus we need to get moving and be more creative ourselves. After all, until we’ve started, it’s all really just talk. But more often we hear it in the negative. When we are acting like adults, we respect those that have come before us, we are motivated by other’s initiative and we learn to start before we are ready ourselves. When we act like children, we get stuck in victimhood and a cycle of defensiveness . When we have the choice, perhaps we should opt for the one with the best chance to unleash our potential and bring us all closer together? And let’s not kid ourselves. We always have that choice.